This business establishment has been serving the public since the turn of the century. Dennis Paquette migrated from Canada to this area in the late 1800’s. Realizing that this was not farm country, but was rich in its resources of timber and natural lakes full of game fish, he decided to start a business here. This building was erected by Dennis and consisted of a bar and hotel. East of his building was a general store, and the office of Brooks and Ross Lumber Company. Boulder Junction was the railway terminal or loading center for the logging company. The stagecoach met the trains in Woodruff and brought people to Boulder Junction. Horses for the stage were kept in a log barn behind Paquette’s. Dennis’ son Bill and his wife Clara took over Paquette’s around 1923. The store building next door burned down around 1925. The store was moved to Paquette’s, so now it housed a store, bar, dining room and hotel. Three meals a day were served, family style, winter and summer. Slot machines (legal at the time) lined the walls. Paquette’s Trading Post was the “in place” in Boulder Junction. We have Bill Paquette to thank for our wide main street. In 1944, Bill sold Paquette’s to Tippy and Ann Reible (Ann is Clara’s sister) and the name was now changed to “Tippy’s”. Times were changing: the hotel rooms were now used for the help, the slots were outlawed, and logging was no longer number one. Now, recreation was playing a more important part in the economy. Tippy and Ann ran this establishment until Tippy’s death in 1961. In 1961, the Schoens bought Tippy’s and ran it until 1967. In 1967, the DeNoyer family purchased Tippy’s. At this time, the name was changed to “George’s”. In 1988, Ken Zima and Linda & Mike Hogue purchased George’s. In March of 1999, George’s served its last customer. The business was closed and the equipment was auctioned. 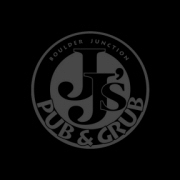 After being empty for a year and a half, Joe & Julie Pairolero started JJ’s Pub & Grub on December 26th, 2000. Joe and Julie previously owned JJ’s Sweet Shoppe in downtown Presque Isle for five years. After running both businesses during the summer of 2001, they decided to sell the bakery and devote all of their time to the Pub. Joe, Julie, Anna & Ally, along with the rest of the staff, make it their personal goal to continue the warm and friendly tradition that has been established here for the past 100 years.